House flipping is all the rage right now. In an appreciating market, everyone thinks they can make money. While the hot housing market is creating opportunities, house flipping is a business that has many costly mistakes. A good flip can earn a flipper tens of thousands of dollars, but a bad depiction can cost tens of thousands of dollars. When considering flipping homes, there are four golden rules to profitability. 1. Get familiar with the market. The first thing one should do, is to educate themselves on the particular area they are interested in or where opportunities present themselves. The goal is to learn everything about that particular area, what distressed properties sell for in that area, what renovated properties are selling for and how long homes are on the market for. This information will give a good indication of the profit potential of a particular area and what's happening in that area. 2. Buy low and sell high. The second thing to remember when doing a flip is that buying cheap is essential (dirt cheap). Being a good negotiator is essential to flip houses successfully. It is important to not act too quickly on any property. Thirdly, property renovations should exceed similar properties that it will compete with. 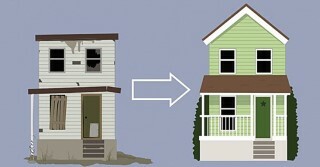 Knowing the comps in the market allows for choosing the proper place to spend renovation dollars. For example, questions to consider: Are furnaces typically replaced, are hot water heaters high efficiency, are granite counters the norm? Should appliances be stainless steel? Do comps have tile floors or ceramic backslashes? If these things are the norm, they must be done in the house to be flipped and one should go even one step further. Knowing what the comparable homes on the market have for amenities and matching or bettering them is essential to profitability. If the house looks better than the comps it will sell quicker than the comps. Lastly, it is important to price the property right. The price should be similar to or even a little lower than what comparable properties are selling for. This may feel counter-intuitive. It might seem that if the home is better than the comps, it should be priced higher. But this is not the case. By selling a slightly superior home to the comps at a slightly lower price than the comps, the time the home is on the market is minimized. Holding a house for a few thousand dollars more is a bad strategy with cost being eating up profitability quickly. List the home a bit cheaper than the comps, sell it as quickly as possible, and get the money out and move on to the next house. Flipping multiple properties in a year is where the significant profits are. These four tips will lead to profitability and success. Those that fail to heed the tips are flirting with disaster. Rick is a real estate broker, real estate author, and longtime Windham resident. You can reach Rick with all your real estate questions and needs at rickyost63@gmail.com.